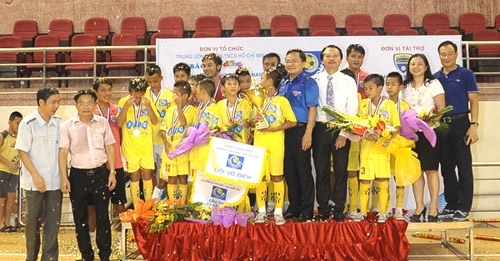 HÀ NỘI — FLC Thanh Hoá defeated Gia Bảo Hải Dương 5-0 in the final match to take the title of the National Children’s Football Tournament. The event was held in the central province of Thanh Hóa on August 18. Taking full advantage of playing on their home turf, Thanh Hóa dominated the match from the first minutes of the game, and three goals were scored in the first half. After the break, FLC won two more goals to fix the match at 5-0. Bảo Trang Thái Bình và SHB Đà Nẵng shared the third place.